Much as I enjoyed singing Jesus Love Me, This Little Light of Mine, and I Will Make You Fishers of Men in Sunday school each week as a small child, those children’s standards were fairly blown out of the water at Christmastime by even better songs—a dozen or more centuries-old Christmas carols with memorable melodies and wondrous word pictures of a baby King named Jesus born in a stable to a virgin named Mary, as a host of heavenly angels joyfully sang “alleluias” to shepherds in fields near a little town on a clear night. Angels announced good news for all people -- the baby in the manger was the Savior, the Messiah! I’m not a kid anymore, but the story in those traditional carols of the coming of the Son of God and Son of Man—the person named Jesus—is still nothing less than absolutely wondrous! So come Advent and Christmastime, I'm happily back to singing blast-from-the-past carols that have been sung by our Christian brothers and sisters century after century—describing the Father’s love revealed in Jesus by the Spirit. Though not as commonly known as carols like Hark, the Herald Angels Sing, O Come All Ye Faithful, Angels We Have Heard on High, Silent Night, What Child Is This?, or It Came Upon a Midnight Clear, one of the oldest Christmas carols is Of the Father’s Love Begotten—part of an epic poem written by Aurelius Prudentius around AD 400 in Roman ruled Spain and sung to a tune written 800 years later in the 1200s. During the past several Advent seasons, Gerrit Scott Dawson, Pastor of First Presbyterian Church in Baton Rouge, Louisiana, has preached sermons within the theme of “Finding New Meaning in Old Carols.” Dawson is author of An Introduction to Torrance Theology: Discovering the Incarnate Saviour, and Jesus Ascended: The Meaning of Christ's Continuing Incarnation, and has been interviewed numerous times on the GCI video program, You’re Included. Dawson’s Advent sermon of 11.28.10 is about the author of the carol Of the Father’s Love Begotten, and the relationship of two of its stanzas to foundational Christmas scriptures Luke 1:30-33 and John 17:24-26. [Click HERE to be linked to the church website to view or download the entire sermon transcript or listen to a recording of this very recent sermon, as well as Advent sermons from 2009.] Dawson highlights the following two stanzas of the carol. Of the things that are, that have been, and that ever more shall be. And the babe, the world’s Redeemer, first revealed his sacred face. 1) The universe came to be as part of the love story of the Father and the Son. 2) Jesus wants us to be taken into his eternal love story. Dawson concludes his sermon by reminding us of the priority of praise. There is nothing more practical than praise. We can’t imagine before we praise God for who he is how this can be. It seems irrelevant. But telling the story back to God, praising him for the love story of Christmas, is actually the only way we get taken into the story. It’s the way we believe. We hear the story and reflect it back. 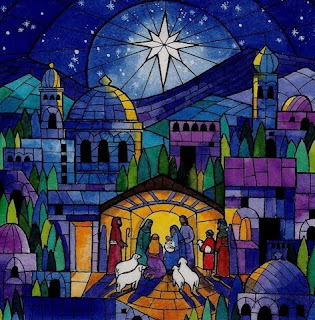 This Advent, let’s take time every day to contemplate just what happened that first Christmas. The eternal Son showed his face in Mary’s arms. Love pierced the sin-dark shroud of the world’s night. Look upon him by faith and enter the love. Amen! Blessings to all as you take part in worship this Advent. If you have not already done so, you may want to visit previous Trinitarian Worship posts 11.26.10, containing the poem “Christ Child”, the 11.30.09 post, Christmas Reader’s Theater, and 11.24.09, Songs for the coming of Jesus.